We have collated a list of our most frequently asked questions in regards to scaffold erectors and services for commercial/residential building work in Essex. We have collated a list of our most frequently asked questions in regards to scaffold erectors and services for commercial and residential building work. If you have any other questions, please contact us. Q: How much does scaffolding cost? A: It all depends on the size & height of the scaffolding structure you require. Usually its never as much as you think. A: Payment is required within 14 days of an invoice being issued which will be once the scaffolding is erected. Q: Can I make adjustments to the scaffold after it has been erected? A: No, your safety is extremely important to us & any adjustments must be discussed with us. Any attempt to alter / change any scaffold invalidates our insurance cover & will make you liable for any damage costs. A: Yes, we hold full public liability insurance up to £10m. Q: Are you fully qualified? A: We have a well trained team. All scaffolders are qualified to CITB standards & work to the TG:2013 & SG4:15 regulations. Q: Do I need to get a license or permit from the council? A: If any part of the scaffold will be on the public highway or pavement then yes a permit will be required, however this is something we’ll obtain & provide for you as part of our quotation. Q: Is the scaffolding safe? A: Safety is paramount to us & our record speaks for itself. Our planning process enables us to create an environment best suited to your specific needs thus minimising any possible chance of accident or injury. Q: How long can I have the scaffolding for? A: Our scaffold prices includes 4 weeks rent as standard, but the scaffold term can be negotiated & tailored to a pre agreed hire contract. If you need to keep the scaffold longer than the pre agreed term then this can be charged on a per day or per week basis. Q: I'm not sure what scaffold I need, can you help? A: Absolutely, once involved in your project we will visit your site & work with you to assess your requirements precisely & provide the expert advice you would expect from us as professionals. Don’t worry if you don’t know what you need, we'll be happy to advise you. Q: I would like scaffolding, what do I do next? 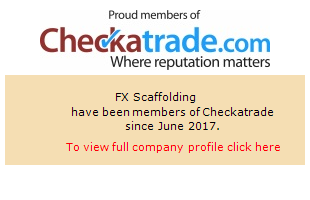 A: Contact us either by phone 07557 764 094 or email info@fxscaffolding.co.uk & we will arrange to visit your site. We’ll talk through your project, assess your requirements, talk through time scales & then provide you with a free full written quotation.